Learn about the potentially dangerous impact of Salvia. Salvia, also known as Salvinorin divinorum, belongs to the mint family of plant-based hallucinogen agents. The salvia plant has a long history of use in religious ceremonies among the Mazatecs of Oaxaca, Mexico. Like many plant-based substances, salvia exists as a legal hallucinogen, though it can still produce harmful effects when abused. Likewise, side effects of salvia can vary depending on how a person uses the drug. Side effects of salvia stem from how this drug interacts with brain. Dosage amount differences also factor into what a person can expect to experience. Like most any other type of drug abuse, side effects of salvia carry certain dangers when used in excess. The way salvia interacts in the brain also poses its own set of dangers for those who have little to no experience with the drug. The active ingredient in Salvia is Salvinorin A. Like other hallucinogens, salvia induces hallucinatory effects that persist for varying amounts of time depending on the dosage amount taken. Salvia also has a unique chemical make-up unlike any other drug. When used for recreational purposes, users either smoke or snort the drug. Most naturally occurring psychoactive substances derive from plant alkaloids. Alkaloids exist as organic substances made up of nitrogen-containing ring compounds. Unlike other nature-based substances, salvia isn’t classified as an alkaloid since carbon, hydrogen and oxygen make-up its molecular structure. This difference likely plays into how side effects of salvia come about. Salvinorin A works as the active ingredient in salvia, commonly known as the most powerful, natural, vison-inducing substance in existence, according Oxford University Press. Consequently, side effects of salvia come with incredibly high risks as the drug’s effects can quickly overpower the brain’s regulatory capacity when taken in excess. Most drugs within any one group tend to interact with certain areas of the brain in similar ways. While the great majority of hallucinogens affect serotonin, GABA and glutamate neurotransmitter outputs, salvia targets the brain’s kappa opioid receptors. Opioid receptors play a central role in the formation of opiate addictions; however, opiates target mu opioid receptors, which produce pain-relieving effects when activated. Salvia’s activation of kappa receptors also produces analgesic effects though in different ways. Opiate-based side effects bring on feelings of euphoria and calm, while side effects of salvia can be rather unpleasant in addition to the drug’s hallucinatory effects. Side effects of salvia also differ considerably from those brought on by other types of hallucinogens like LSD and mescaline. Hallucinogens in general alter the brain’s sensory input creating hallucinations that may be of external or internal origin. In effect, this group of drugs blocks incoming sensory information from the body while stimulating the cognitive and emotion-based centers of the brain. Short-term side effects of salvia develop in much the same way, sometimes causing a person to feel disconnected from the surrounding environment, according to the National Institute on Drug Abuse. Side effects of salvia can also vary in intensity depending on the dosage amount ingested. In effect, a salvia “high” can last anywhere from a couple minutes to several hours. 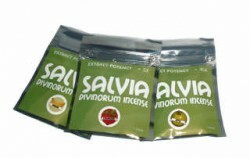 Small portions of salvinorin A, salvia’s active ingredient, can produce a full-blown “high” effect. Anywhere from 200 to 500 micrograms is sufficient enough a dose. Anything over 500 micrograms can potentially leave users in a highly agitated state. High doses of salvia greatly distort a person’s sense of coordination, leaving him or prone to stumbling, falling and running into walls. Side effects of salvia also disrupt the emotion-based centers of the brain causing users to cycle through multiple mood states. As with other hallucinogen drugs, behavioral side effects of salvia closely resemble those of a full-blown psychotic episode, according Maryland.gov. These profound effects result from the influx of neurotransmitters throughout the brain. Considering how neurotransmitters act as the brain’s chemical messengers, any changes in chemical levels can offset any number of mental and physical processes in the body. People suffering from mental health problems may see their symptoms worsen as a result of salvia effects. As psychological disorders take root within existing chemical imbalances in the brain, side effects of salvia will likely exacerbate an already existing condition. Likewise, people at risk of developing psychological problems may actually hasten the onslaught of a disorder with ongoing salvia use. Some people may well experience panic attacks from the drug regardless of whether a pre-existing condition exists. As salvia can produce intense hallucinogenic effects, users also stand the risk of experiencing flashback episodes of past “highs” long after the drug wears off. Flashback episodes tend to be just as intense as the actual drug trip and can happen at any given time. While hallucinogen drugs are not nearly as addictive as opiates, alcohol or stimulants, the brain can develop a tolerance to the side effects of salvia over time. Tolerance level increases set the stage for physical dependence to take hold, both of which are precursors to addiction. Increases in tolerance levels also cause damage to brain cell structures, which can lead to permanent brain damage with frequent, long-term salvia use. The practice of snorting and smoking salvia delays its overall effect, driving users to increase the dosage amount prematurely. As it only takes a small amount of the drug to alter brain chemical levels, users place themselves at considerable risk of overdose, one of the more costly side effects of salvia. Salvia’s analgesic properties can quickly lead to respiratory distress, respiratory failure and even death with a large enough dose. Considering how dangerous side effects of salvia can be, frequent use of this drug comes with harmful consequences, some of which can be deadly. If you suspect you or someone you know may be experiencing side effects of salvia, call our helpline at 1-(800)-895-1695 to speak with one of our representatives, toll free, accessible 24-hours a day.